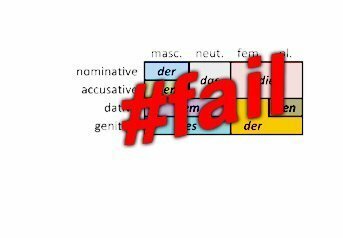 german case chart | German is easy! and welcome to… well… I don’t actually really know how to call it. It’s something really silly, but also really cool. So… I was working on the article on relative pronouns that I wanted to post this week, when I suddenly ran into a problem. Whooops… looks like you just reached the limit you can read for free. 2 posts a week are for free. That should be enough to check up on something every now and then. If you want more – why not become a member?! As a member you’ll get unlimited access to the over 500 (yup, 500!!) epic fun articles about words and grammar.